Interior design tastemakers and social media influencers from throughout the Southeast have been selected for the Nashville area’s inaugural House for Hope Designer Show House partnering with builder, Carbine & Associates, with a goal of yielding over $100,000 for children’s charities. Forest Home Media is serving as the project public relations and marketing team. Modern Farmhouse in style, the 2017 House for Hope Designer Show House takes place in March with a rock star team of Southeast interior design tastemakers. Builders of the 2013 Traditional Home magazine and the HGTV® Smart Home in Nashville, James Carbine, president of Carbine & Associates, said the home event will be one of the first of its kind in the nation and located in a new Williamson County neighborhood, Southern Preserve. The 2017 House for Hope Designer Show House team includes: Kristie Barnett, The Decorologist, Nashville, TN; Kara Blalock, Lauren Blalock, ReFresh Home, Franklin, TN; Julie Couch, Julie Couch Interiors, Nashville, TN; Lucy Farmer, Lucy’s Inspired, Birmingham, AL; Angie Forte, Jerome Farris, Peddler Interiors, Murfreesboro, TN; Chad James, Chad James Group, Nashville, TN; Gina Julian, Gina Julian, Nashville, TN; Colleen Locke, Trot Home, Nashville, TN; Jamin and Ashley Mills, The Handmade Home, Montgomery, Alabama; Lori Paranjape, Redo Home & Design, Franklin, TN; Rhoda Vickers, Southern Hospitality, Atlanta, GA; KariAnne Wood, Thistlewood Farm, Kentucky. Daryl Walny, Carbine’s vice president of operations, said almost half a million people follow the design team on Instagram and Facebook with hundreds of thousands of page views per month for their personal websites and blogs; it will be an exciting journey until the home is open for tour. “We are interested to see the different and inspiring perspectives of these unique designers. From website blogs to social media posts, the entire project will have so many creative elements,” Walny said. Located off Lewisburg Pike in the new Franklin neighborhood of Southern Preserve, the over 4,200 square foot home is a beautiful Modern Farmhouse with a painted brick exterior, covered porches, gourmet kitchen, four charming bedrooms, a children’s playroom and game room. The House for Hope Foundation was begun in 1993 by Carbine, his brother, the late Denzel Carbine, and the Carbine team. Over the years, numerous subcontractors and vendors have joined Carbine in building beautiful homes with 100% of the proceeds helping area children’s charities. This will be the first time a building team has partnered with multiple interior design creatives. The House for Hope Designer Show House will be open for tour in March. Follow the build at www.CarbineAndAssociates.com. Here’s more information on the House for Hope and Southern Preserve. We’re all about the home….garden and food! As home lifestyle industry PR/marketing professionals, Forest Home Media took some #influencers on the ultimate Tennessee home field trip last week – the Governor’s Residence in Nashville with a tour by First Lady Crissy Haslam. We love grabbing our creative friends for fun outings and were happy to have along garden lifestyle expert Carmen Johnston, Nashville Entertainment Journalist and TV Host Kelly Sutton and NYC PR practitioner Jennifer Zawadzinski (whose firm reps Pinterest, Instagram and Facebook). Before I share the highlights, I need to disclose I FORGOT my dreamy camera and all pics captured with my iPhone. Yes, this can be done (and better than below), check out this tour of the White House by acclaimed photog Brooks Kraft – White House Tour with an iPhone 6 for some great tips! Forest Home Media hosted Carmen Johnston, Carmen Johnston Gardens, Jennifer Zawadzinski, NYC PR rep, with Nashville Entertainment Journalist Kelly Sutton for a visit to the Governor’s Residence and tour with First Lady Crissy Haslam, middle, with FHM Partner Nancy McNulty, second to right! We chose our favorite tree, located on the sun porch, themed to all things East TN wonderful. Years ago as a state agency spokesman and member of the governor’s information staff, I had the opportunity to visit this beautiful home regularly and I was SO happy to see the integrity of the property and the beauty of the home as been nonpartisan-ly maintained over the years. Stepping into the foyer of the Georgian-style home, the checkerboard foyer always makes me SO happy. The staircase is wrapped with garland, and, throughout the downstairs area, there are multiple trees decorated for Christmas including ones representing Middle, West and East Tennessee. Even though I’m Middle Tennessee born and bred, the East Tennessee tree was my fav. The Georgian style Governor’s Residence sits majestically off Franklin Road, south of Nashville. Dickson, Tennessee ornament artist Jim Marvin’s work was on full display and no rest for me until I have some of his holiday work. Nationally recognized, love knowing that the “Tennessee Christopher Radko” has an outlet just down the road from our Forest Home office. The First Lady gave us a magical tour. We were all so impressed by the measures she’s taken launching school field trips, cultivating a garden with the harvest used for dinner parties and the way in which she has graciously embraced the wonder of Tennessee and displayed it in this beautiful home. We stepped outside for the tour of the garden while reporter Kelly Sutton interviewed the First Lady here for Williamson Source. Garden Lifestyle Expert Carmen Johnston visited the gardens of the Tennessee Governor’s Residence as a guest of Forest Home Media. Ornamental Peacock Kale and white kale in the garden of the TN Governor’s Residence. No, we didn’t recognize these. Our thanks to Tommy Johnston, Woodruff’s Chief Grower and hubs of Carmen Johnston. The First Lady is heading up a green house construction project on the 10-acre estate. We can’t wait to visit again to see project complete. The Governor’s Residence is a Tennessee wonder and be sure to tour if you get a chance. More info here! And before the tour is complete, there has to be a Nashville celebrity sighting! This vintage pic of Elvis Presley caught our eye. The First Lady shared a charming story that Elvis dated the daughter of Governor Buford Ellington for two years and visited the residence bowling on the top floor bowling alley – what?! This little known story was backed-up when the flooring was removed to reveal a bowling alley. Part of the floor is framed here as well as a cute pic of the young couple! Forest Home Media has just completed the uber successful Kings’ Chapel Parade of Homes outside Nashville. To stay up on the our latest adventures and to find out how you can be a part – connect with us on Facebook! As home lifestyle industry PR/marketers, staying up on the latest in home design and building is a must. Recently, I had the chance to tour ,with my PR colleague, Jennifer Zawadzinski, the uber chic, idea-filled 2014 Hampton Designer Showhouse in Bridgehampton, New York, benefiting Southampton Hospital and presented by Traditional Home magazine and open daily through September 1. (Note, the home tour allowed visitors mobile phone pics only.) So JZ’s first observation was how do you harness the creative talent of over 25 top interior designers into one beautiful home that makes sense. After being part of the PR team for the 2011 Nashville Southern Living Showcase Home, built by top Nashville builder, Castle Homes, I knew this could be accomplished with a smart person at the helm. On the day of our August tour, we lucked upon meeting this diplomat and design powerhouse who helped shepherd designers through the process, Greg McKenzie, of Greg McKenzie Design. 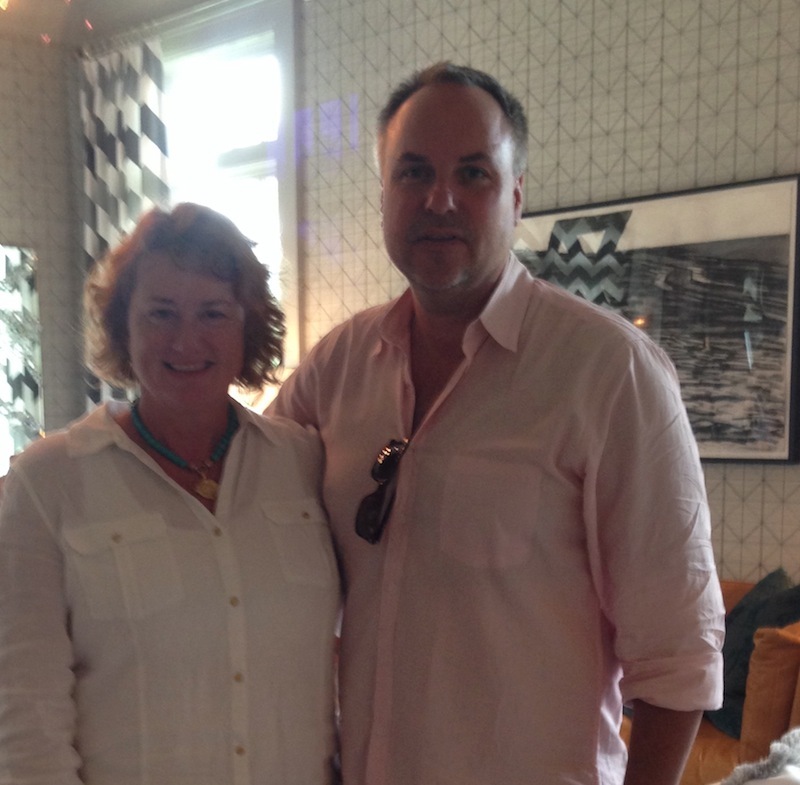 FHM Partner Nancy McNulty with Hampton showhouse designer Greg McKenzie. Visit his website or Facebook page for a true look at his dreaminess. McKenzie served as the project design team coordinator and also created the gorgeous library and laundry room. He’s a repeat contributor to the Hampton Designer Showhouse brand. Killer library vignette includes embroidered grasscloth & antiqued mirror from Guastavo Olivieri Antiques. The stunning, shingle home was built by Paramount Custom Homes. Their quality and detail was impressive and spectacular, but, P.S. fellows, you are amazing builders and need new head shots, like yesterday, which reflect the multimillion-dollar amazingness of your home. Certainly, Paramount has a plethora of signature building elements, but, one must-see is incorporating the wine room into the dining space. Convenience and art are merged as a great way to display a collection. A Montauk privacy fence also uses this same idea for an art installation – pictured below as well. We saw this chandelier early in our Hampton visit at Gansett Lane Home which I chronicled on Instagram. The three-tiered piece reflects the cluster of three-dining tables for awesome symmetry and cool continuity! 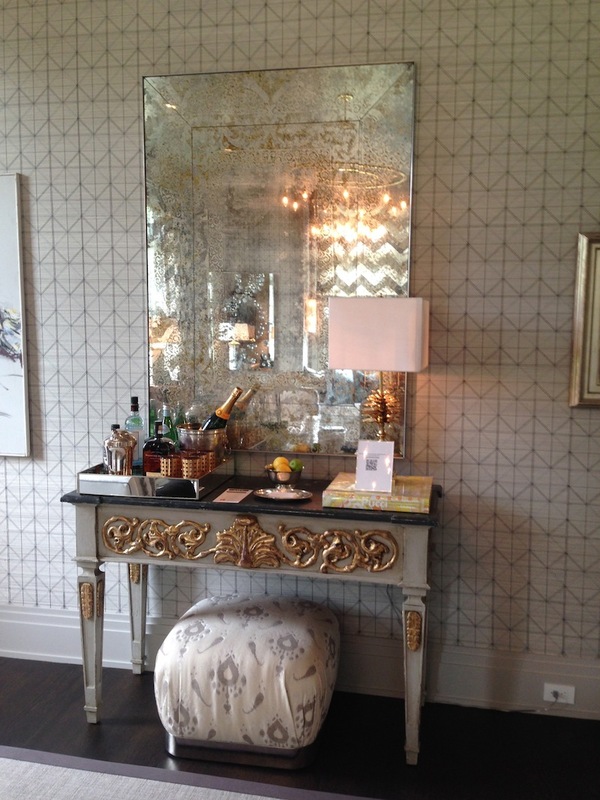 Wine room is woven into the dining room design of the 2014 Hampton Designer Showhouse. Here are some of my favorite design elements of the home. Pops of color are the key to inviting and memorable design. Many of the rooms had a soothing palette of Farrow & Ball in muted tones with vivid use of lime green, orange and navy creating a most memorable impression. Forest Home Media seeks to incorporate this technique in photos used for magazine covers and newspaper centerpieces. And, think about it, you achieve that beautiful creamy, dreamy palette and then you can change your setting with a pop of color as the season and whim suits you. An impressive carrera marble island dominates the kitchen with delicious lime accent pieces.